Concept: 10/10 Today I’m reviewing two very cute, and very similar, cafe simulation games by Pati Games. These games are “I love Pasta” and “I love Coffee”. Both games let you manage your own cafe. In I Love Pasta, you’re cooking spaghetti, serving bread and wine, making new noodles, sauces, etc. In I Love Coffee you’re running a coffee house where you grind your own beans, add syrups and flavors to drinks, and probably (haven’t gotten that far) sell snacks such as sweets and pastries. Gameplay 10/10 Gameplay in both games is extremely similar but with a few differences. First we’ll look at the similarities. 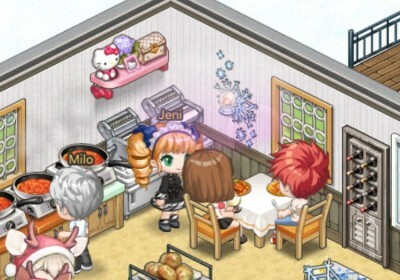 In these games you decorate your cafe with items which raise the score of your cafe and in turn attract new customers. You can add wallpaper, carpet or tile, plants, windows, choose the colors of the tables and chairs, add more lighting, or choose cute themed decorations from famous pop culture references like hello kitty. You also can dress up your own avatar (and the avatars of your staff.). Both games are fast paced, maybe too fast. I go to sleep, or go to work, and come home and my food is burned, or my friends have clicked my cafe so much that I don’t have room to store all the pasta they’ve made lol. Energy refills super quick; and from what I can tell; energy is only used to travel in search of ingredients to make your pasta (or coffee). In both games, it helps to have friends, because you can travel to their cities for some bonuses, or they can (as I mentioned) travel to your cafe to help you out. Also, gameplay is not limited to just your cafe. In time, as you level up, you’ll unlock flower shops, candy stores, and more interesting locations. You can have your friends in game run these shops for you; and in turn, you can help them run their shops as well for some nice perks. You can interact with customers or staff by clicking on them in your restaurant to earn tips, encourage them to stay longer (order more food/drink), or encourage them to leave to free up tables for new customers. Lastly, the games feature the same currencies, gold (the standard “default” currency); or the more valueable “cash” currency which is rewarded sometimes in quests but most often purchased for USD. I Love Pasta features a tarot card element. Each day you can get your fortune read which gives you a bonus (sometimes cash, or other useful items). Edit: Both games have this feature. I Love Pasta features an additional currency called puzzle pieces. These can be used to purchase dressup items from the shop. You can gift up to 100 friends one puzzle piece per day and collect puzzle pieces from your friends as well. I Love Pasta also features wine tasting, where you must correctly suggest a wine (you must also have the wine available to sell as well) for your customers from various types of red or white wine. I Love Coffee has a dating sim element in a way, by allowing you to go drum up business for your cafe by interacting with customers on the street. You’ll be presented 3 dialog options, and must answer all 3 correct to get the customer to come into your store. I Love Coffee features a dice game where you roll a dice and move around a gameboard to collect special decorations, cash, and prizes. The way food is crafted in both games is also very different. I Love Pasta features a memory (the card game where you match like pairs of flipped over cards) based mini game, as well as a rhythm mini game where you tap the items in time with the music. I Love Coffee on the other hand is about memorizing what size drink, how much milk/sugar/water/etc and which flavors of syrup to use and if the drink should be hot or cold. I Love Coffee makes you tilt your phone or tablet to “pour” the drinks, while I Love Pasta is just a tapping type of interaction. I Love Coffee makes you pass different tastes and have your drinks judged by critics and board members to level up your drinks; where as in I Love Pasta, your food levels up just from cooking it over and over. Lastly, I Love Pasta uses your Facebook account (optionally – not required for play) while I Love Coffee uses your Line account (which may be optional as well because I think it may allow you to play as a guest.). I didn’t see Facebook integration in I Love Coffee; and I would think Facebook is a more recognized social network than Line. But with Line you can also play Line Play which is an awesome dressup game so I recommend signing up for a Line account anyways. Graphics: 10/10 The graphics in both games are extremely similar and extremely cute and colorful. The ability to customize everything about your shops and your staff and yourself is huge. There’s (prettier) hair and clothes available in in-game events or available from cash shop rewards. You can pay more to get the exact item you want, or try your luck in the much more affordable lottery system. Items change based on gender, so you can scroll through your staff to play the lotto as different characters. Music: 5/10 Music isn’t bad, but isn’t the highlight of the game either. It’s cute and simplistic and fits well with the overall game; but it does tend to get repetitive after playing for a long period of time. Voice Acting: Not Applicable. Not sure if the original game (in Japan or Korea) had any voice overs, but the English one does not. Story: 2/10: Unfortunately there is little to no story in this game series. I Love Pasta has a bit more of a story I think than I Love Coffee, but still not enough of one to earn high marks here. In I Love Pasta, the story is that your father thinks you’re old enough to take over his business, he wants to travel and see the world, you’re distraught because you’ve always been a lazy, carefree person, who doesn’t know how to cook, or run the cafe. Your best friend runs a cafe of her own, and she helps guide you through the game. In I Love Coffee, your grandfather gives you a cafe, and it’s supposedly always been your dream to run your own Coffee House. Characters: 3/10: There are a variety of cute characters. However, they lack story or character development to bring them fully to life. Customization: 10/10 I’ve mentioned several times, but customization is really the focus of this game. I’m adding a score for customization to offset the low Story and Character scores to more accurately reflect my enjoyment of these two cute apps. It’s worth noting that if you don’t take into account story or character development it’s 56/60 or a 93%. I dunno if I’d say it’s an “Excellent Game” by my standards since I care so much for story and without that the games get dull and repetitive fast; but I do feel it deserves better than a C- or 70% but that’s the most objective score I can give it.